SFN Zenith N.O.P., Jeroen Dubbeldam’s FEI World and European Championship mount, is one of six SFN horses who'll be auctioned in September. Photo by Mollie Bailey. The Showjumping Fund of the Netherlands has announced that it’ll sell all six horses under its ownership—including SFN Zenith N.O.P., Jeroen Dubbeldam’s FEI World and European Championship mount—in an online auction on Sept. 21. The auction will be operated by BVA Auctions in the Netherlands. Formerly known as Springpaarden Fonds Nederland, the SFN was created in 2006. The uniquely structured syndicate group was the brainchild of Dutch equestrian journalist Jacob Melissen. 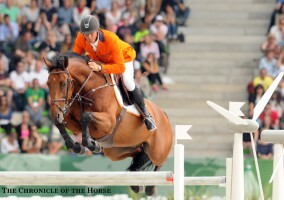 It was Melissen’s initial vision to create a financial fund, open to Dutch equestrian fans, who wanted to invest in keeping some of the finest Dutch-bred horses on home soil and made available to Dutch riders. Five of the Netherlands’ leading horse dealers, Emile Hendrix, Willy van der Ham, Egbert Schep, Teus van den Brink and Johan Heins, advise the SFN Board on the horses the fund should purchase and which riders should take them. Only when all five agree unanimously will an investment go ahead. SFN Zenith N.O.P., a 12-year-old Dutch Warmblood gelding (Rash R—Sascha, Fuego du Prelet), who with Dubbeldam won team and individual gold at the 2014 Alltech FEI World Equestrian Games (France), team and individual gold at the 2015 FEI European Championships (Germany), and team gold at the 2014 Furusiyya FEI Nations Cup Final in Barcelona, Spain, is the most high-profile horse in the auction. Other horses included in the sale are Aquila SFN, Chuck Blue SFN, Djumpsina SFN and Ferrari SFN. You can read more about the individual horses on the SFN Auction site. “The first SFN has been hugely successful and has not only contributed towards an unprecedented period of success for the Netherlands in the sport of show jumping, but has also given the original investors a great deal of emotional pleasure in supporting the horse and rider combinations,” said Henk Rottinghuis, the president of the SFN board. “We thank everyone involved in the SFN for their support and commitment over the last ten years, and we hope to reward them with a good financial return from the auction. The horses can be purchased by auction, both on location at BVA Auctions in Amersfoort, the Netherlands, or online, on Wednesday, Sept. 21.